Youth SSVP members are between the ages of 12 and 17 (secondary school age). They are members in SSVP groups in schools, parishes and at special works such as Ozanam Clubs. They do fantastic work both directly through giving their time and indirectly, by organising appeals and fundraisers. Youth SSVP groups around the country groups have made a huge difference in their communities. What do Youth SSVP groups do? Youth SSVP is all about faith in action. Members meet together in prayer and friendship, where they discuss how they can help those in need in their communities and plan how they are going to do that. Youth SSVP projects have ranged from gardening at nursing homes and hospices to helping out at a soup kitchen. Most Youth SSVP groups are in secondary schools, with staff members supporting and assisting them in their works. Youth SSVP gives you a chance to put your faith into action. You will meet like-minded people and learn about yourself and the world that you live in. Perhaps you’re not entirely sure what faith means to you right now? By serving others, you not only learn about yourself and develop your skills and confidence, but you can also learn about what it means to be a Catholic. Are you working towards a Caritas Award? Joining the Youth SSVP gives you an excellent option for achieving the goals of the Caritas Award. You might be organising appeals or events in your school, or you could be working closely with the local SSVP parish Conference. Whatever the work, it is always a positive experience. Of course joining the SSVP means that you are helping people in need in our communities, but it also helps you! Volunteering is a great way to get experience that can be very useful when you are applying for a job or for further education- it shows that you are committed and responsible. This isn’t the number 1 reason for you to volunteer, but it is a great benefit! Do you work in a secondary school and are interested in starting a group in your school or parish? Not sure what’s involved? A President and secretary elected by secret ballot. Other roles such as vice president and treasurer can be assumed when necessary. 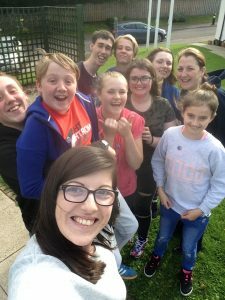 We think that educating our young people about the SSVP, the people involved in it and where it came from are excellent ways to connect our young people both to the Catholic Church(and their place in it) and to give them a greater sense of the world that they live in. In becoming involved in the SSVP, they learn so much about themselves and other people, as well as learning about commitment and responsibility. There are various ways that we can help you to introduce the SSVP into your classroom. There is a wealth of experience in local communities across Scotland. Our 2000 members regularly give assistance and support to some of the most vulnerable and in need people in the country and always serve those people with dignity and respect. Their strength lies in the stories that they tell(always maintaining confidentiality for the people that they help)- often eye opening to pupils and teachers alike. If you would like to make contact with a member of your local SSVP Conference, please contact 0141 226 8833 or email youth@ssvpscotland.com and we will direct you to the appropriate Conference. This annual, residential Conference provides small groups of pupils who are joining the SSVP in S3 with a solid foundation in the SSVP, poverty and social justice amongst other topics. Time is also spent learning about communication and team building, as well as to reflect, ending with the celebration of Mass. Being over two days, it also gives the groups a chance to bond with other like-minded young people. The Conference is held at the beginning o the school year at the Conforti Institute in Coatbridge and is delivered in partnership with the Education Team at the institute, as well as The Poverty Alliance. Further information will be posted when available. Complete the below details to add yourself to our newsletter.